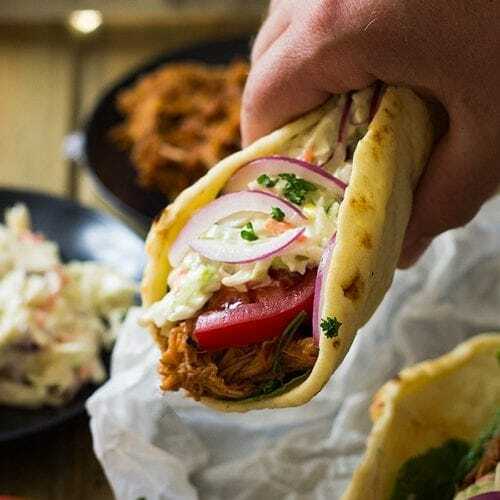 BBQ Pulled Pork Gyros ~ Filled with BBQ Pulled Pork, Creamy Coleslaw, Tomato, Onion and All Wrapped in a Soft Flatbread. 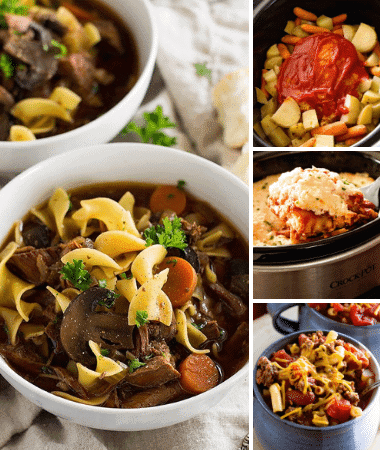 Perfect for An Easy Lunch or Dinner! Ok, these bbq pulled pork gyros may not be “authentic” but they are darn good!! I didn’t use a tzatziki sauce but instead used a nice homemade creamy coleslaw. It’s super simple to put together but you could use a favorite from the store too. These have been on the menu a lot around here lately! One because I can use the leftovers from crockpot pulled pork and use it for sandwiches all week and two because they are super addicting!! The hubby and I can’t get enough of these! The kids did enjoy them minus the red onion, but to be honest I sort of kept it for myself. I know, I am one of those parents that hide food in the back of the fridge then takes it out and hides in a room somewhere to eat it. Hey, a girl has got to do what a girl has got to do! 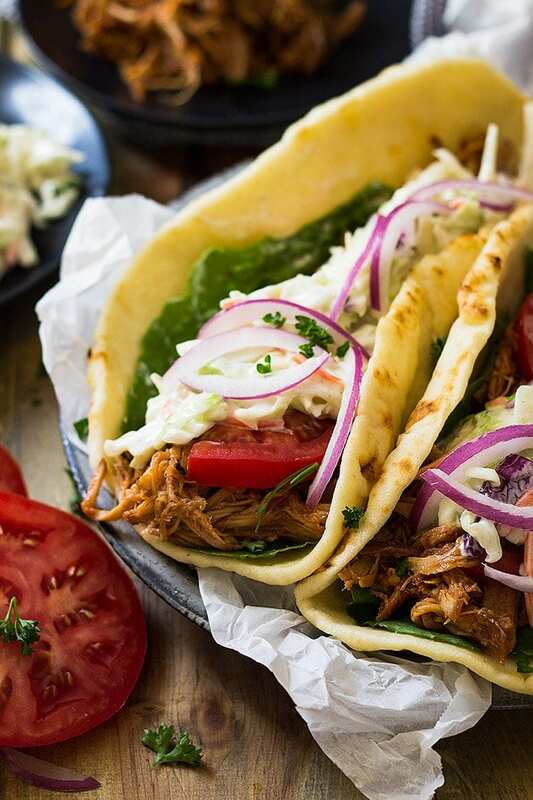 But anyhoo, these bbq pulled pork gyros are made simple with the use of your handy dandy slow cooker. Just put your pork roast in and forget about it for 8 hours and you will be rewarded with tender, juicy meat. Then pour on your favorite bbq sauce (I like a sweet and sticky kind). So, while these may not be completely authentic they are still super delicious!! 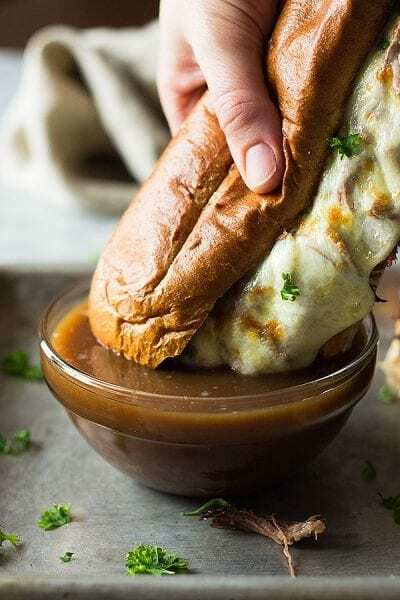 They are easy to make and are perfect to eat any day of the week!! I think I will be making these all summer long! Cook once and have lunch all week, nothing wrong with that!! 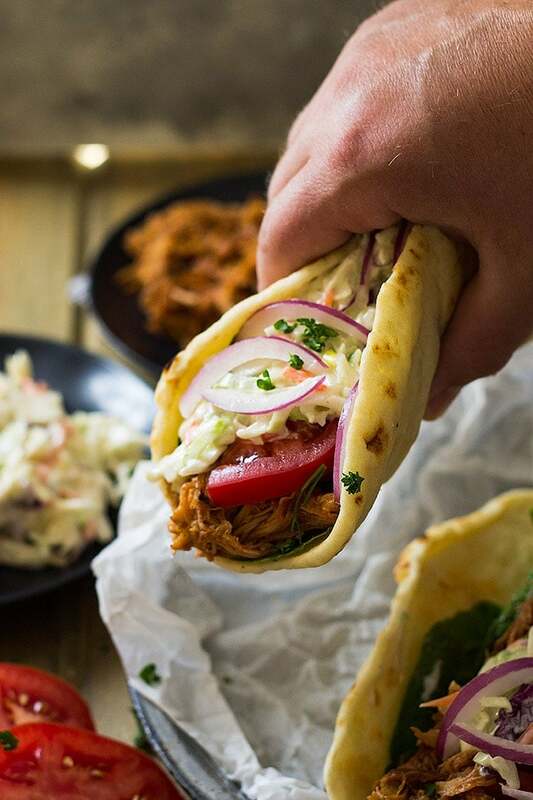 Filled with BBQ Pulled Pork, Creamy Coleslaw, Tomato, Onion and All Wrapped in a Soft Flatbread. 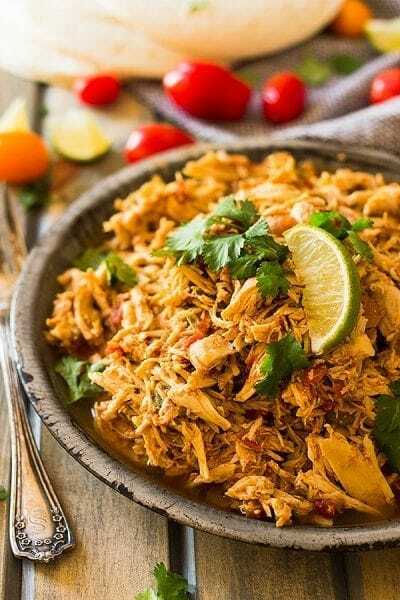 Perfect for An Easy Lunch or Dinner! Place the pork roast in the crock pot with chicken broth, salt, and pepper. Cover and cook on low 8 hours. I don't recommend cooking on high. When it is done cooking, remove the roast and shred with 2 forks and stir in enough bbq sauce to coat all the meat. You can also moisten the meat with a little of the cooking juices, I usually use about 1/2 cup. 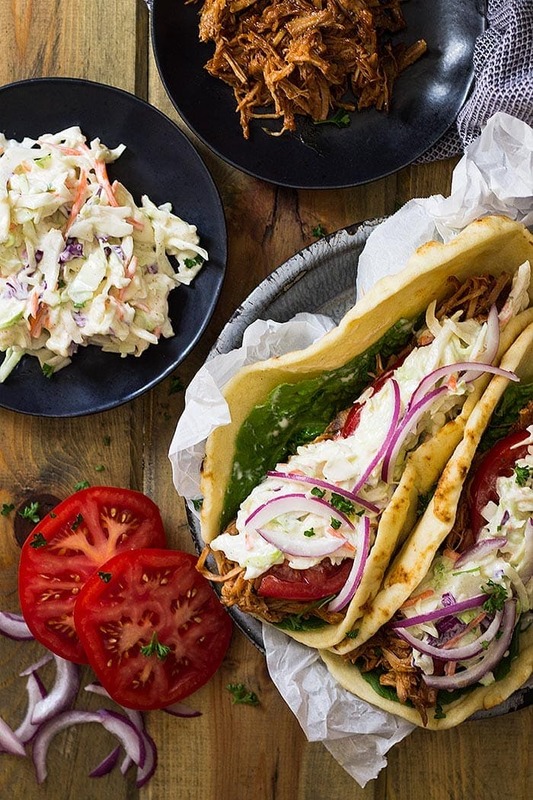 Warm your flatbread a little then top with bbq pork, coleslaw, lettuce, tomato and onion. Serve immediately. Leftover meat can be stored in the refrigerator for up to 6 days. I need to make this asap. Loving the flavor combo with the fresh coleslaw! 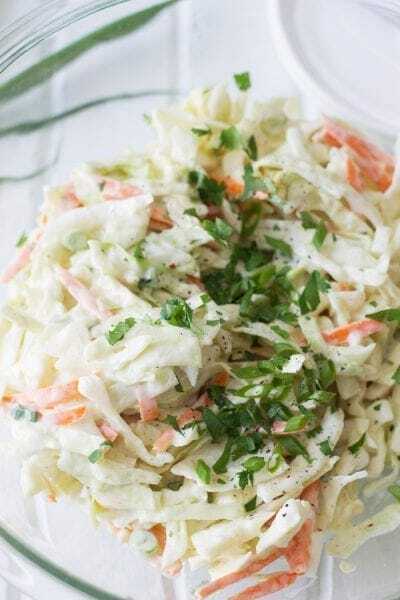 Coleslaw + Pulled Pork is heaven in my book!